President Barack Obama, capping a far-flung Asian trip of mixed results, assured Russian President Dmitry Medvedev on Sunday that getting the Senate to ratify the START nuclear weapons treaty is a "top priority" of his administration. "I reiterated my commitment to getting the START treaty done during the lame-duck session," Obama said, noting that Congress returns next week for its postelection session. In talks with Medvedev on the sidelines of the summit of the Asian-Pacific Economic Cooperation (APEC), Obama also reiterated his support for bringing Russia into the World Trade Organization, calling Russia "an excellent partner." His bilateral talks with Medvedev took place on the final day of Obama's 10-day Asian tour, his longest trip away from the White House. He left Washington still reeling from an electoral defeat on Nov. 2 in balloting that allowed the Republicans to recapture control of the House from Obama's Democratic Party. The GOP already has set afoot an ambitious legislative plan of its own for the new Congress that convenes in January. But before that, a lame-duck session will have to confront lingering issues, including not only the START treaty but also decisions on whether to extend Bush-era tax cuts and on the administration's push for Congress to pass a law repealing the military's ban on homosexuals serving openly in the service. The START treaty, which has been pending in the Senate for months,would reduce the limit on strategic warheads to 1,550 for each country from the current ceiling of 2,200. It also would set up new procedures to allow both countries to inspect each other's arsenals to verify compliance. The treaty has drawn resistance, principally from minority Republicans. A congressional aide briefed on White House plans for getting it ratified told The Associated Press this week that the White House was adding $4.1 billion in funding for the U.S. nuclear arsenal in an effort to pick up the necessary votes. Obama and Medvedev discussed the plodding pace of the ratification process, a problem that threatens to undermine U.S.-Russian relations and bleed into other issues, a senior Obama official told reporters shortly after the meeting. There is an uneasiness within Russia on this issue and Medvedev is being well briefed about the dynamic of the Senate, said the official, who spoke on condition of anonymity to discuss details of the closed-door meeting. The official said that if there is progress in the lame-duck session, Russian lawmakers would be likely to quickly follow suit. On other issues, Obama praised Medvedev for strongly condemning the beatings of journalists in Russia, and the U.S. president pushed for prosecution. The two leaders also discussed containment of Iran in its purported pursuit of nuclear weapons, and Obama and Medvedev have no disagreement about how to proceed, according to the Obama official's account. In Seoul earlier, Obama maintained he has not been weakened by the electoral setbacks and used a sports analogy at one point to say he thought expectations are sometimes too high. Obama said he can't always hit a home run in these international summits and that even a single here and there is an achievement. But he was rebuffed by his G-20 summit partners in Seoul in his push for their backing of the administration's demand for a tougher line against China in connection with its currency, the yuan. The United States has accused Beijing of keeping the currency too low and has argued that this has cost the United States exports and the jobs they produce. He also failed to win final agreement with longtime ally South Korea on a new free-trade pact, although the two sides agreed to continue efforts to resolve differences over the treaty. Obama now must confront a host of domestic issues in the United States, although he will take time out next week to attend a NATO summit in Lisbon, Portugal. He was due to return later Sunday to the White House after 10 days in India, Indonesia, South Korea and Japan. Asked during his picture-taking session with Medvedev whether his administration was putting more money on the table for the nuclear program to get the START treaty through the Senate, Obama declined to answer. He did say, on another matter, he believes Medvedev is bringing about reforms in the former Soviet Union and is moving the country forward. He said he supports Medvedev's pursuit of membership in the World Trade Organization - a point the Russian leader reinforced as he and Obama appeared briefly before reporters and camera crews. He said he is "working closely" to achieve that end. 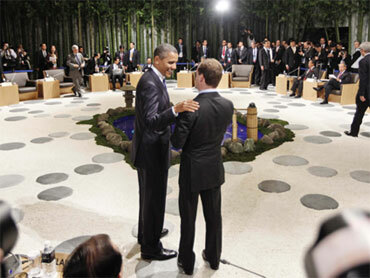 Both Obama and Medvedev touted a close working relationship and friendship. Obama extended thanks to Moscow for cooperation on Afghanistan and on a host of international issues ranging from the Middle East to Sudan. Said Medvedev: "It has been very pleasant for me to have this meeting and discuss a whole range of bilateral and multilateral issues with my colleague. Indeed, we have a very good relationship. We understand each other very well. It's very important to attain agreement on a whole range of issues." The congressional aide who revealed the plans for additional nuclear funding spoke on condition of anonymity because he was not authorized to comment publicly. The official said the plan was outlined to Republican Sen. Jon Kyl of Arizona, who is seen as the key to winning enough votes to ratify the treaty. The additional money would come on top of $10 billion the administration had already agreed to over 10 years. The administration is scrambling to get enough Republican support in the Senate to ratify the New START treaty before the Democrats' majority shrinks by six in January. In a sign of the urgency of the administration's pitch, government officials traveled to Kyl's home state of Arizona to brief him on the proposal, the aide said. Officials also briefed Republican Sen. Bob Corker of Tennessee. At the photo session with Medvedev, Obama said he looked forward to seeing him at a NATO summit in Portugal next week and said the pair has scheduled "a host of consultations so that we can reduce tensions and increase cooperation on various security matters in the European theater."